The Global Festival of Action for Sustainable Development is designed as an inclusive convening opportunity for the international SDG community. 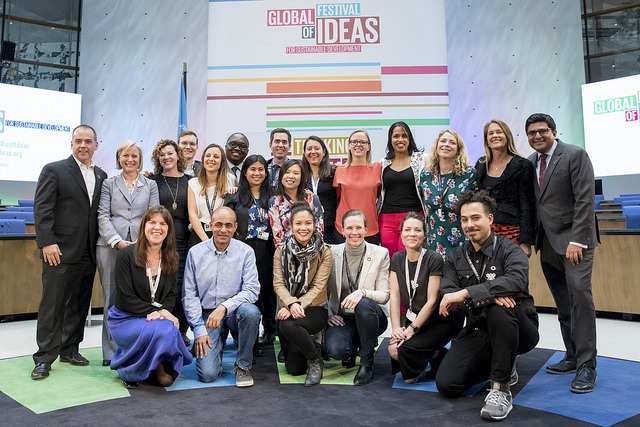 Driven and hosted by the UN SDG Action Campaign, who lead the overall strategy and program of the Festival, we are looking for partners to help curate, co-design and support the direction and delivery of the event. There are a range of partnership opportunities to fit a variety of needs. Interested in making your mark as serious mover and shaker in this space? Keen to expand your network and organizational visibility? Keen to play an active role in shaping and influencing the conversations to revolutionize sustainable development? The 2030 Agenda not only requires a revolution in thinking and action, but also a paradigm shift in support, promotion and buy-in to the people and projects that will make the achievement of these critical goals possible! We want to recognise and celebrate the supporters and advocates of the global sustainable development movement by offering the opportunity to put your name against and feed your insights into THE meeting place for the Global SDG community. Festival partners not only have the opportunity make their mark as a collaborator in this agenda through high-level visibility at the event but also as co-designers, co-curators and committed actors to furthering the conversations required to achieve the SDGs. With over 1,000 diverse participants from around the world expected to join us at the event – representing civil society, government, youth, the private sector, activists, artists, cities and more – this is a prime opportunity to tap into their potential to advance the SDGs! There are a variety partnership categories being explored, for an overview of different options please see below. Organizing partners organize substantive contributions to the Festival programme, usually meaning that each Organizing Partner organizes and runs several sessions. Organizing sessions includes topic planning, speaker invitation, briefing and management as well as facilitation. Organizing partners cover associated session costs for their track to facilitate own staff, speakers and moderators travel and accommodation. Organizing partners support outreach and promotion of the event through sharing event information with organizational contact lists and networks, individual professional networks and contacts and promoting the Festival on organizational websites and social media channels. Organizing Partners will have their logo featured whenever all partner logos are displayed, such as on the website, in the program (digital or print) and at the venue. Each partner will benefit from the overall visibility generated in and by the press and traditional and social media about the Festival. Supporting Partners are expected to support outreach and promotion of the event through sharing event information with organisational contact lists and networks, individual professional networks and contacts and promoting the Festival on organisational websites and social media channels. Supporting Partners will have their logo featured whenever all partner logos are displayed, such as on the website, in the program (digital or print) and at the venue. Host City Partners will have their logo featured whenever all partner logos are displayed, such as on the website, in the program (digital or print) and at the venue. Sponsors will have the opportunity to have their organizational branding featured during the Awards Ceremony. Media partners take on public outreach for the Festival to reach diverse audiences and support activation towards the Festival and SDGs more broadly in a way suitable to each specific Media Partner to be further discussed with the UN SDG Action Campaign. Media Partners will have their logo featured whenever all partner logos are displayed, such as on the website, in the program (digital or print) and at the venue. If suitable representatives of Media Partners could moderate or facilitate sessions and potentially run a session with content related to the communication of SDGs. Media partners receive primary access to Festival content as well to the participants. The UN SDG Action Campaign is able to manage interview opportunities. Media Partners will have the optional opportunity to be present at a physical space during the Festival, such as with an interactive booth in the Innovation Fair or another co-branded space and joined visibility such as at the SDG Studio. Organizations wishing to be involved with more limited time, money or capacity are offered flexible engagement options, such as organizing one particular substantive session, being present at the Innovation Fair, running a challenge/competition, being involved as artistic contributors or any other creative way to be jointly determined. The logo of these partners will be featured in a way suitable to their specific involvement. For example, an organization running one session would have their logo featured next to that session in the program and during that session.The logo of these further partners will not be featured on the overall conference materials. These partners are expected to support outreach and promotion of the event through sharing event information with organizational contact lists and networks, individual professional networks and contacts and promoting the Festival on organizational websites and social media channels. Partners will benefit from being associated to the overall visibility generated in and by the press and traditional and social media about the Festival. We’ve given ourselves a 15-year deadline to achieve the SDGs and it’s going to take all of us, working together, to get the job done. We have 12 years left! Please do join us in Bonn. We have a huge task ahead of us, but the results will be ground-breaking! Partners will be added to the consortium on an ongoing basis. Please contact info@globalfestivalofaction.org if you are interested to join the Festival as a partner or with any innovative and contributing element you would like to propose.